Website catalog secured by Verisign. Don't hide your favorite coins away in dusty old boxes! 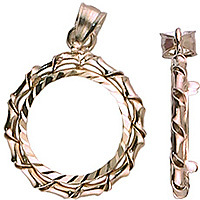 Display them in beautiful gold and silver bezels and wear them as pendants, earrings, cufflinks, or other dazzling jewelry. Coin bezels are the jewelry frames that allow you to wear your favourite coins. Some are fastened with screw-tops while others use prongs on the back to fasten the coins in place. Bezels are often worn as pendants but are also available as earrings, bracelets, rings, pins, money clips, key rings, and other jewelry styles. Click on the blue "Catalog" button at the very top left of this screen to see the available coin jewelry. Our latest 16-page color catalog can be viewed HERE as a PDF file. NOTE: You will need the latest version of the FREE Acrobat Reader to view this file. The prices in this catalog are retail. Dealer inquiries are welcome. Custom orders are very possible. Website © Copyright Coin Creations LLC. 2000-2012. All rights reserved.